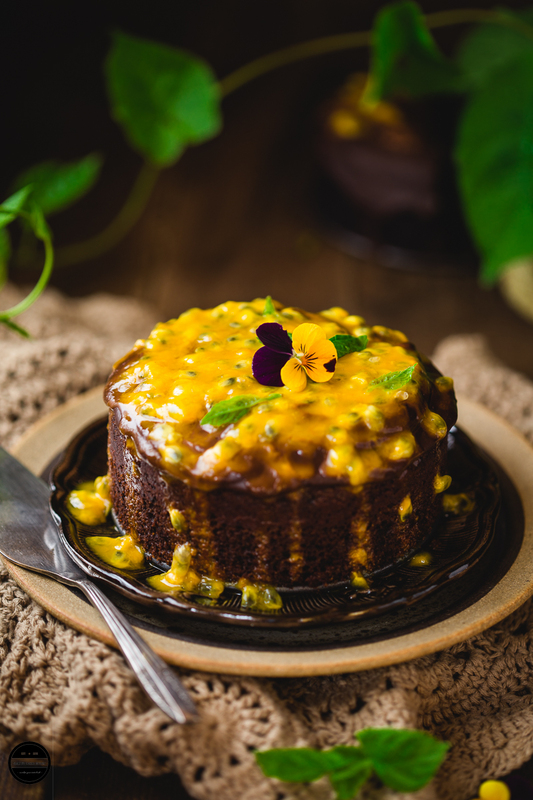 Chocolate and Passion Fruit Semolina cake | How to make chocolate and passion fruit semolina cake, basically heaven on a plate and each crumb of this cake tastes divine! 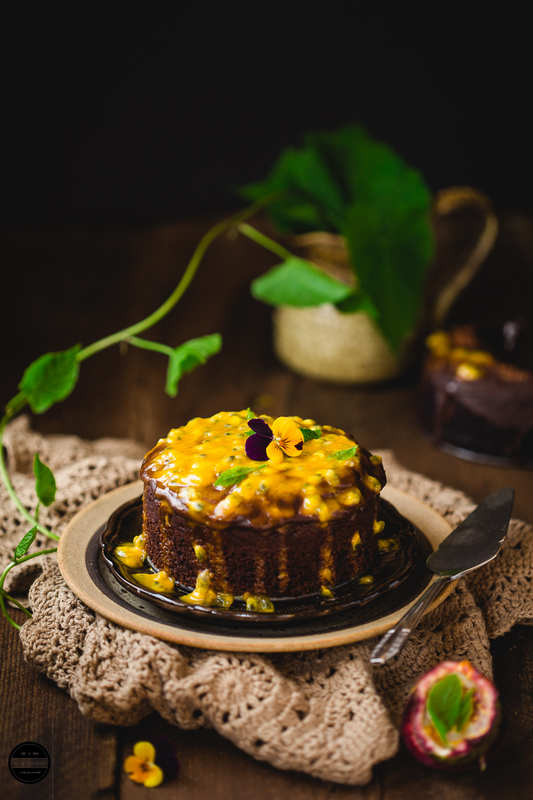 The rich and decadent chocolate cake, dressed up with vegan smooth and silky dark chocolate ganache and it's top dripping with juicy and exotic passion fruit coulis which creates a 'self-saucing' element. This delicious and indulgence cake is totally dairy and egg free thus it's suitable for vegan. 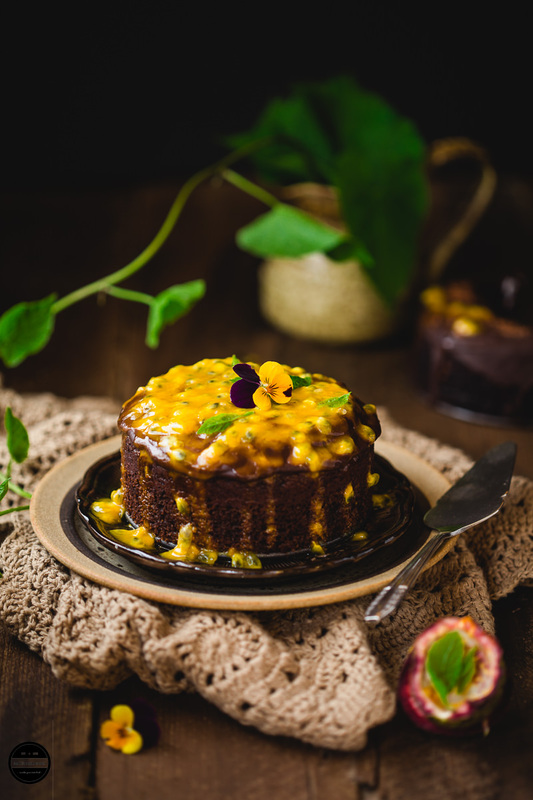 Chocolate cake is tasty as it is, but you can make it even more scrumptious by the addition of a layer of passion fruit puree to undercut the richness and it also balances the sweetness. Finish your next family get together or a special occasion such as Father's day with this ultimate dessert, and just be warned this sumptuous-looking dessert will make you and your guests swoon over and maybe one slice is never enough. It's not that I am very good in baking, past few years I have not baked much, a couple of birthday cakes here and there and that's it, Somehow I did lose interest in baking, no idea, can't pinpoint any particular reason for it. I have everything required for baking, still, that enthusiasm and also the inspiration has been missing. Just in time folks from All things Baked sent their recently launched wooden baking set to us and asked me if this beautiful set inspires me into baking? All things Baked is a speciality bakery which has been baking past many years and are experts in all types of baking, and now they have expended their company and share their passion for baking and creating with the general public. If you are new to baking or just want to build your skills in it, All things Baked are happy to help you out. Once you subscribe with them every month they will send you a box of surprise baking ingredients, decorations and a step by step recipe card to bake some delicious goodies. The Wooden Baking Set Box, handcrafted and engraved looks so wonderful. It is designed by All things Baked and handmade using natural Beech and Bamboo wood and very well crafted with a good quality wood. It's a good alternative to baking with metal and silicon tools. The box comprises different tools such as Chopping board, Whisk, Small serving/mixing bowl, Scooping spoon, Spatula, Rolling pin and decorative tweezers, each and every item is in a smooth finish so this set can be suitable for those tiny little hands too. These tools are easy to clean and with a very little maintenance to keep them in good condition for a long time. I love the idea of the wooden storage box, so there is no way you can lose those precious tools of yours. 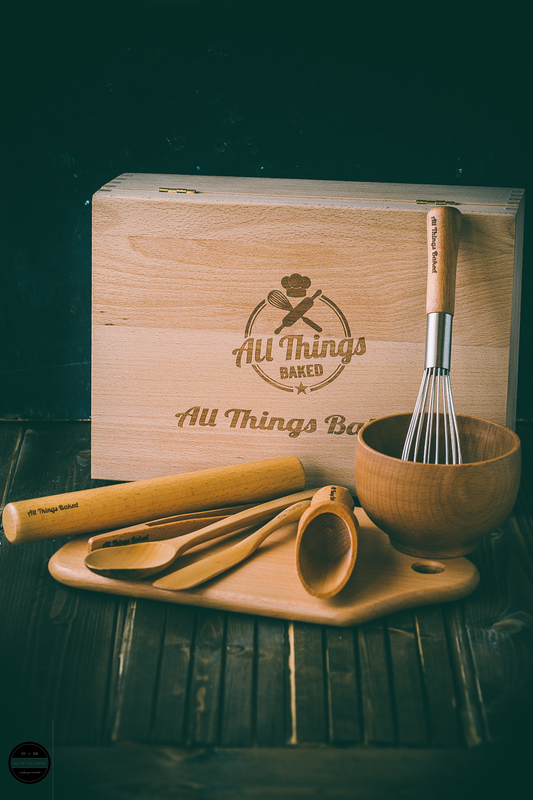 This All things Baked wooden baking set can be a great gift for those who love to bake or someone wants to join this therapeutic hobby, or simply get it for yourself and have great fun using it with your family. I immediately got encouraged putting to the use this fantastic wooden baking box, and baked exotic Mango, Coconut and Lime Loaf Cake and this an easy one-bowl Chocolate and Passion fruit Semolina cake, and this time I prepared ganache too :) now that's a lot of improvement in my baking thoughts and skills. This cake turned out smashingly good, moist and luscious. It was baked to perfection, risen so well and the centre part did not collapse. That same day I had to bake another one as the first one got gobbled up by us, including me who doesn't even like chocolate half the time, before even I could take pictures :) Because I baked second time on the same day that means I could whip up this cake in no time, it's a straightforward recipe. 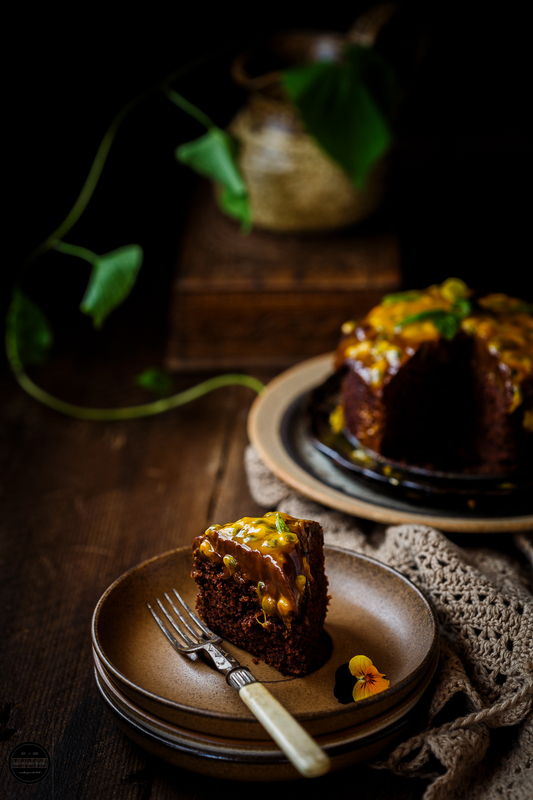 This Chocolate and Passion fruit semolina cake is heaven for chocolate lovers. This recipe is a keeper! Instead of coconut oil use any flavourless oil. Don't have coconut milk? use any other nut milk such as almond or hazelnut. 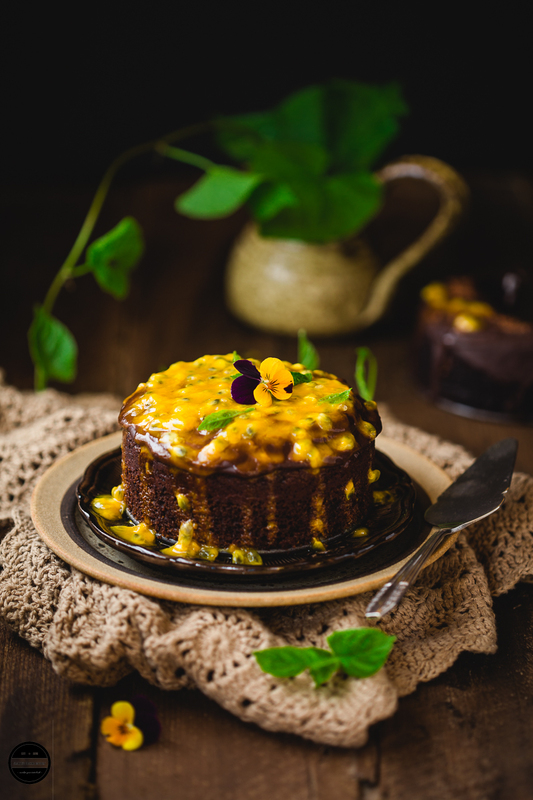 Want to make just an eggless cake? use normal dairy products instead. 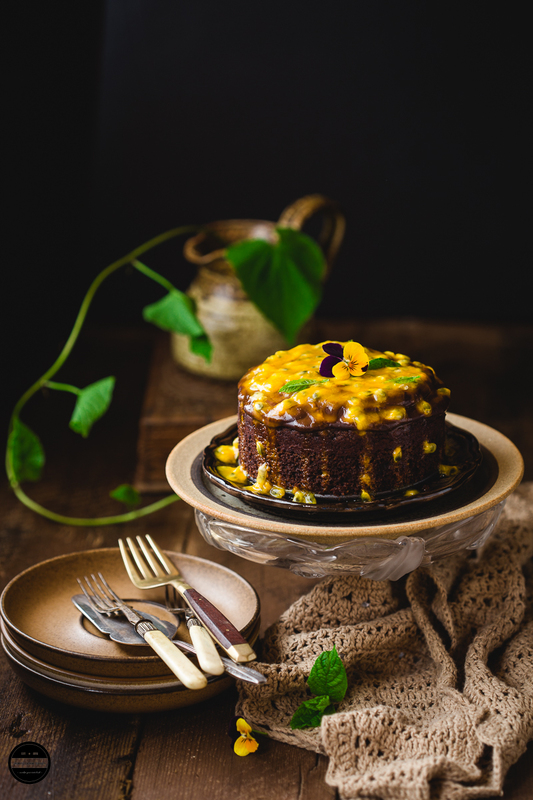 Chocolate and Passion Fruit Semolina Cake, baked using dark chocolate. This cake is the perfect balance of bittersweet chocolate and tart passion fruit. It is vegan and easy to follow the recipe. Preheat the oven to gas mark to 4 or 180C. Grease the cake tin and dust with the cocoa powder. In a big bowl add all the cake's dry ingredients, then add melted oil, vanilla essence and milk. Mix well but do not over mix. Pour the batter into the prepared cake tin and bake for 40 minutes or until skewers come out cool. Meanwhile, make chocolate ganache by first heating up the coconut milk, do not boil. Pour on chocolate chips and mix well until all the chocolate melts completely. You'll get smooth and silky ganache, leave it aside for later use. Make passionfruit coulis by heating both ingredients in a pan for 3-4 minutes, leave it to cool. Once cake perfectly baked, remove it from the oven and let it cool completely on a wire rack. Then spread the chocolate ganache how you like it. You can cover the cake fully or only the top part. Let the ganache set for a while. Then pour passionfruit coulis on the cake. Cke is ready to serve. Disclaimer - Thank you All Things Baked for sending us wooden baking set box. I was sent this baking box for an unbiased review and not told or paid to write a positive review. All opinions are my own. I would never think of combining chocolate with passion fruit. I love them both and I need to try this cake asap! Thanks Edyta, please do let us know how it turns out for you. This is such an amazing combination of flavors! And a gorgeous cake! Passion fruit is one of my favorites! Totally need to try it in a chocolate cake. I really miss the passion fruit.. not easily available in India.. Used to enjoy the desserts in Brasil. The cake looks Divine. Can't take my eyes off the pics. Thanks Shobha, yes this fruit is only widely available in tropical countries. Jagruti, What a stunning cake! I like the combination of passion fruit and coconut in this cake!Yum! What size baking pan did you use? Would love to bake this easy cake some time. Thank you. Thanks Pavane, I used 12cm cake tin. Am just wowwing here..How pretty this cake looks and that passion fruit coulis looks simply out of the world. Cant take my eyes from this gorgeous cake Jags..
A double wow Jagruti..one for the beautiful wooden baking set and the other for the cake. I've tried a mango and passion fruit cake but never a chocolate and passion fruit one. Looks absolutely delicious. Looks beautiful with those passion fruit coulis! That wooden set looks amazing! Cake looks super moist and delicious. That baking set looks so good. I will make this cake soon. Thank you! Such a lovely one Jagruti, would love to have a piece of it now. Awesome. The cake sounds flavorful nd absolutely delish ! Cake looks amazing and so moist... Must be very delicious and flavourful. Beautifully presented. this sounds lovely. I am taking it that you are using dry semolina not ready made stuff? Nice to see somebody else's recipe for egg and dairy free. I am going to book mark your blog for a nose later on when I get time to. Thank you Elaine for the lovely words. Glad you like this recipe and blog. yes, I have used dry semolina in this recipe. Unusual combination. You are an amazing baker .This is an interesting bake.Thanks for the wonderful recipe. comment disappeared so I'm carrying on ... Passion fruit was never something we had growing up so I always think of it as ultra exotic. I think we all have dips with our baking passion - I do love it but don't bake nearly as often as I used to. Life sort of gets in the way.